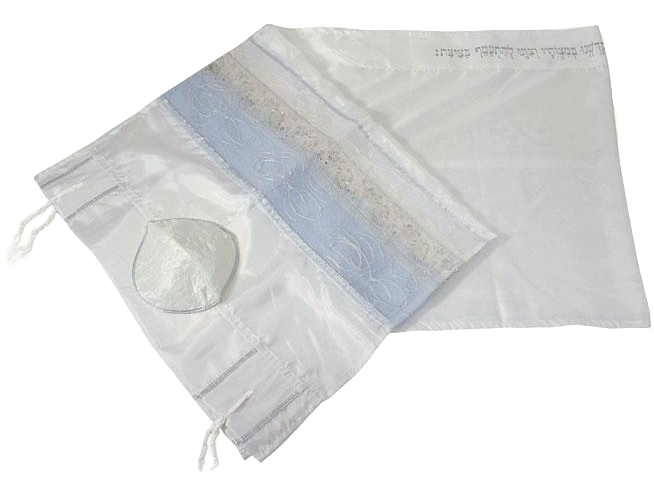 This feminine hand made tallit set is made of silk and traditionally decorated with blue stripes and exquisite silver patterns. The Israeli designers have inspired themselves from the country’s natural settings in order to create this classical feminine tallit set. The clear waters of the sea and the summer’s sky are reminded by the light blue stripe edged by a golden one, just like a sea shore has the beach as its boarder. 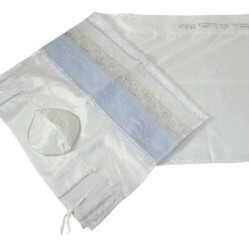 This prayer shawl made out of silk has a classical look as the blue (known as tekhelet) is traditionally used to dye the Jewish prayer shawl. It is accompanied by a white kippa and a bag.